The Fukushima Daiichi nuclear disaster is having significant consequences on our environment. Dr. Lee Newman, associate professor at the State University of New York’s College of Environment Science and Forestry, discusses phytoremediation as a potential clean-up method. Dr. Lee Newman is an associate professor at the State University of New York’s College of Environmental Science and Forestry. Specifically, Dr. Newman teaches in the Department of Environmental and Forest Biology, where she focuses her research interests on the use of plants to deal with environmental problems. 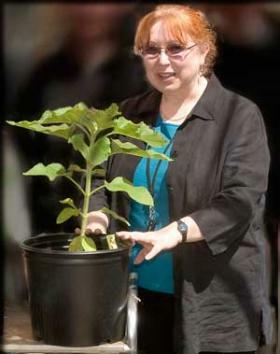 She earned her PhD from Rutgers University and Robert Wood Johnson Medical School in 1993 with a concentration in phytoremediation, and molecular and cellular biology. Scientists are again looking to biology rather than engineering technologies to solve emerging environmental problems. More and more decision makers are beginning to accept phytoremediation, which is the use of plants to clean up contaminated soil and water. It’s a system that was first proposed by researchers over 25 years ago to remediate toxic waste sites. We now know various plants and other organisms can clean up toxic wastes like heavy metals, pesticides, chlorinated solvents, explosive compounds and radioactive compounds. And now, Japanese scientists have identified a local species of microalgae that might be able to remove radioactive cesium out of the water contaminated in the triple meltdown of the Fukushima nuclear power plant. Severely damaged by an earthquake and tsunami in March 2011, plant operators have been building more metal storage containers for the radioactive cooling water flowing from the damaged reactors. What to do with that water is still undetermined. Researchers tested 200 species of microalgae and found a strain that was particularly good at collecting cesium. They have also located another marine plant that might remove strontium as well. That’s the good news. The bad news is the owners of the plant are not supportive of the research. That’s not surprising as nuclear energy production is an industry where most of the people are engineers and not familiar with biology. Also, while promising, the microalgae identified by the scientists is not a magic bullet for the treatment of the contaminated water. Much more research is going to be necessary to quantify effectiveness under real world conditions. Still, this catastrophe presents a golden opportunity if the power company and the Japanese government could look beyond engineering solutions and consider the efforts of these researchers. There is a lot of potential in plants for dealing with a problem badly in need of innovative solutions.